What an incredibly sad tragedy it was to lose one of America’s funniest and all time greatest comic geniuses Robin William’s to suicide brought on by a debilitating case of depression. If one good thing could come out of this horrible event it would be a moment of awakening of America’s collective compassion, as well as acceptance, of the serious nature our mental health problems really are in this country. We can no longer ignore and try and bury this growing issue in the deepest recesses of our health care system as if it doesn’t pertain to every single individual nationwide, or even worldwide, for that matter. It is past time that we finally relegate mental health with equal concern to all other considerations in our health care system. As a person who suffers from MS I know this all to well as I have spent many of my working years in the mental health field as both a group home counselor and as a unit coordinator in a mental health treatment facility. But there is even a bigger reason for my concern and interest in the field of mental health. As a child, I was also diagnosed with mild to moderate depression. And in a strange way my, on again off again, depressive state is much like the multiple sclerosis I was diagnosed with sixteen years ago in that it can be triggered into an active dark state of being only to recede just as quickly back to a place of relative remission. And also just like MS, depression is a silent and invisible intruder, that stalks its prey with little if any noticeable changes to anyone outside of the person who is experiencing its extreme emotional and physical wrath. In my case, I have been extremely fortunate to never have been so consumed by my inner demons as to consider suicide a viable alternative, but that doesn’t mean that from time to time I must find the inner strength to face these forces of emotional mental destruction head on. And my deepest battle with these personal enemies came simultaneously, which one would expect I think, with my diagnoses of multiple sclerosis. It rocked my mental world in the worst kind of way right to its core. At that time I couldn’t think of anything any worse that could have ever happened to me. Which of course, isn’t true. But it did take me two plus years of being on the antidepressant Zoloft along with strong family and friend support before again the Sun finally rose in my world. I am very happy to report now that I have been reasonably safe and sane for going on nearly ten years, but I am always aware that it takes vigilance and a positive outlook on all aspects of my life to remain ahead of the many pitfalls that can occur without warning to stay one step ahead of depression. And one of the biggest things that I have come to realize in my fifty seven years of life is that we all, without exception, can fall victim to our own mental instabilities and emotional environmental trauma’s. And just like the flu, anyone at anytime can have a mental health crises. And it’s nothing to ever be ashamed of because it’s just one more of our shared human frailties! RIP Robin, we’ll miss the laughter that you brought into all of our lives! 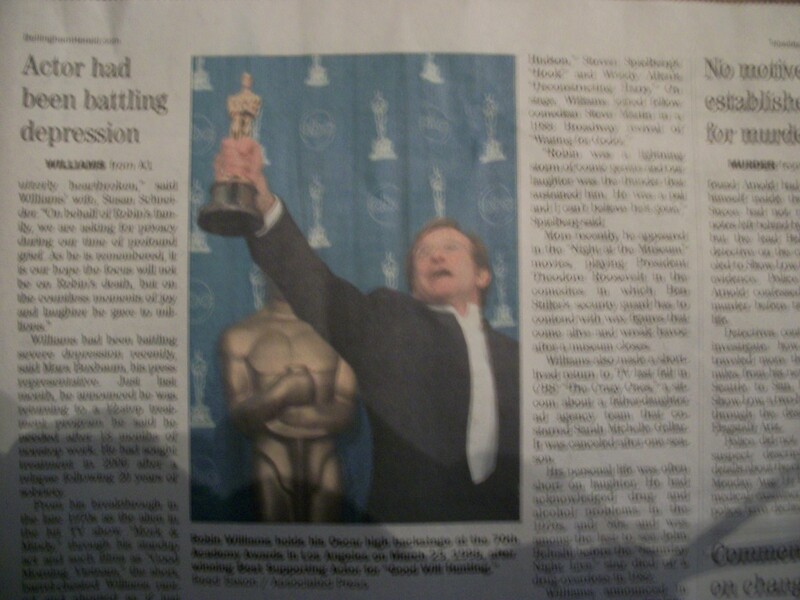 This entry was posted in Robin William's Tribute, Uncategorized and tagged Depression, Health Care System, Mental Health, Multiple Sclerosis, Robin William's Tribute, Suicide, Zoloft on August 14, 2014 by msandbeyond. When I say that I understand your pain, I mean it! Keep writing about your feelings so people can read that part of you that they keep trying to ignore! In the end, it will help everyone! Thank you 🙂 I should try keeping a blog again, I suppose… I’ve never been very good at keeping up with posting, in the past… I have endless insights, musings, and experiences I could share, though… Sometimes it just seems as if words are vastly inadequate at trying to communicate the thoughts in my mind. Still… I think I should try… Seems like a tremendous waste of synaptic activity if I am the only one I share my thoughts with 🙂 Especially the ones about mental health in this society ( or lack thereof )… If my past, my pain, my journey could reach even one person enough to keep them from going to that darkest of dark places from which they never return…. Then I have to try, yeah? Yes. you have to try again. Facebook is a great place to advertise tour blog material and I guarantee if you post in the mental health sites that you will get feed back! And I know that you help more then just one person, you just have to reach out and bring them to you! Have a great day!